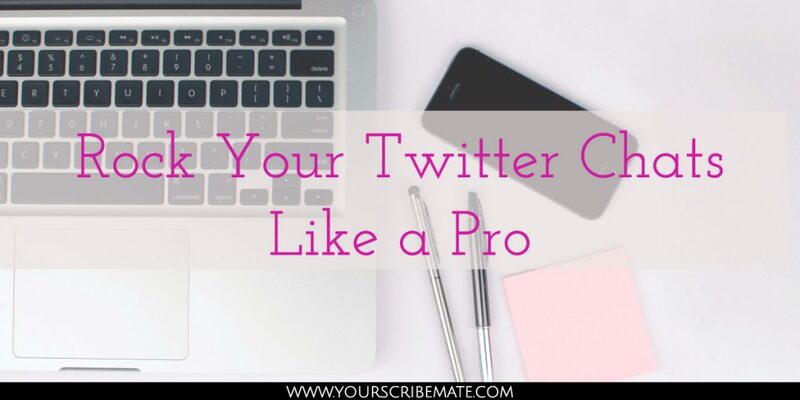 Rock Your Twitter Chats Like a Pro! If you aren’t participating in Twitter chats you’re missing out one of the best ways to connect with other people in your space and gain new, actively engaged, non-bot followers. But how do you find them? And how do you know which ones to join? Keep reading, and I’ll show you exactly how to participate in chats to become more visible and find new people to connect with on Twitter. First – the basics. What is a Twitter chat? A Twitter chat is basically a conversation that happens on Twitter around a specific hashtag at a preset time and for a specified amount of time, usually an hour. There’s a host, and that host will tweet out questions and anyone who wants to tweets out their answers, all using the specific hashtag. So – now that you know what a Twitter chat is, let’s talk about how to find them, and how to participate in the effectively. There are several ways you can find a chat to participate in. Twubs is a great resource – you can search for chats by topic, category, or name, and find out exactly when they’re happening. Another way to search is Tweet Reports. Or you can use Twitter’s Advanced Search function to find Twitter chats. They aren’t very organized over there, so it’s a little harder to find specific topics, but it’s easy enough to find chats. Another trick is just using Twitter itself. If you see a string of tweets from someone you follow that are clearly from a Twitter chat, follow the hashtag and check it out. Even if the chat is over, make note of the date and time and come back for the next chat. Deliberately follow influencers in your industry and watch their tweets. There’s a good chance they’ll participate in at least a few Twitter chats, so pay attention to which ones they choose. I don’t recommend just Googling for chats. It’s not impossible to find them that way, but it’s a lot more difficult. Ideally, you want to participate in chats that are active, hosted by someone who you follow or are at least want to connect with, held at a convenient time (always check the time zones), and usually involve topics you have some expertise in. Once you’ve found one or more Twitter chats you want to participate in, should you just show up and start answering questions? You certainly can. I’m not going to say that I’ve never done that. But a little preparation won’t hurt. First, start thinking about the topic. Most of the time, the topics are announced ahead of the chat so participants can prepare. Jot down a few notes about the topic. Maybe use a tool like Stencil to create a graphic or two so you stand out from everyone else. Next, go back and look at past chats. See how the conversation flowed and make note of who was in the chat. Start to follow some of them a few days ahead of the next chat. Create a specific Twitter list for them so you have them in one place. Interact with them before the chat, so they recognize you when you show up in the chat. People are more likely to engage with other users they recognize. This one is so important! It’s my number one tip/reminder about Twitter chats. You can have the best answer to the question, but if you don’t remember to add the chat hashtag to it, you’re answering in a void. None of the chat participants will see your tweet, and it won’t be part of the chat record later. You have to remember that hashtag! Your Twitter followers will see a random tweet with no context and won’t know what you’re talking about, either. Your chat answer should be formatted just like the one above from the host. “Q1. Here’s my amazing answer to your questions. #bufferchat”. I’ve seen people tweet their answers using both “Q1” and “A1”. A1 is technically best, but it doesn’t really make that much of a difference. But make sure to use one of them so that chat participants knows which question your tweet is answering. Yes, you want to answer the questions the host asks; that’s the whole point of the Twitter chat, after all. But don’t ignore everyone else. If someone else says something that resonates with you, reply to them and tell them so. Like other people’s tweets, talk directly to them. You’re trying to make connections, so connect with as many people as you can. Pay attention to the official chat questions, though. Twitter chats can move quickly and you need to keep up. And whether you’re answering a question from the host or from another participant, quote their tweet when you reply, don’t just tweet. It makes it a lot easier for everyone to know immediately what question you’re answering. Yes, using A1 or A2 does that, too, but by the end of the chat there will be several questions that have been asked and everyone’s not going to just remember what the first, second, etc questions were without seeing them. When the chat is over, don’t just close the window and move on until the next chat. Reach out to the hosts to say thank you, follow anyone you had a connection with during the chat. Even just a simple “It was great chatting with you today!” can go a long way toward building connections and relationships. You’re not finished once the Twitter chat ends. Once you’ve followed up with the people you connected with as I mentioned above, be sure you continue to foster those relationships. Pay attention to your engagement and your follower count. You should see it start to rise as you participate in more chats. Love this idea and want to do your own? Come back next week and we’ll talk about how to host your own Twitter chat!